Cirel's SensASIC family of custom ASICs addresses custom IC requirements for various sensor conditioning and read out applications. Applications are primarily for consumer and industrial applications and the IC could be delivered either as a known good die or packaged solution. 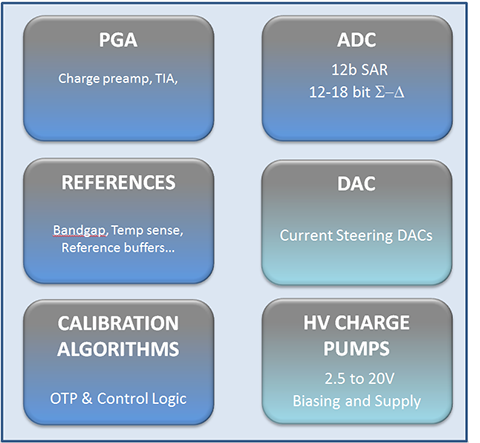 A platform consisting of various building blocks for these requirements containing low noise PGA, sigma-delta and nyquist rate ADCs, DACS and other building blocks is proven and be used to develop custom solutions. A leading component provider of human interface solutions wanted to develop an ultra low power IC. The battery operated product was designed as a replacement for an earlier passive device to reduce cost and complexity. Customer had made a prototype using discrete ICs for proof of concept for performance however power consumption of the ASIC was the key challenge. Finding a silicon partner was a challenge for the customer as several vendors did not deem the power budget as practically achievable. 1. Cirel understood the complete system a key step to ensure the modules specs were derived clearly. All module specs were derived with system implications in mind. 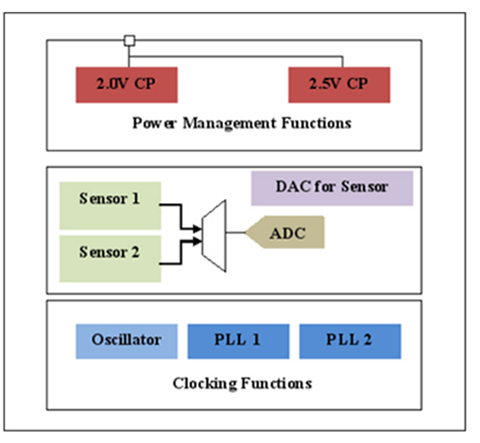 Specifications for sensor interfaces were derived with complete understanding of the system issues along with the customer. 2. Cirel provided the key innovation in power consumption by using an innovative solution to generation of a high voltage function on chip which required 5X lower power than conventional technique. Cirel is developing a family of PMICs for portable power management applications. More details will be added shortly. Copyright © 2013 Cirel Systems.All rights reserved.